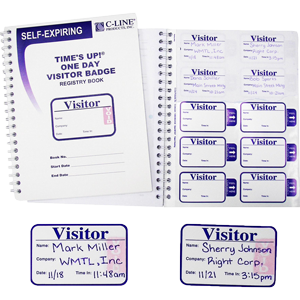 Visitor Pass Time Expiring Sign-In Books are a great, cost effective way to monitor visitors on your site. The books are available as standard unpersonalised books, or are customisable with your companies logo or design. As visitors sign in, the the Visitor Pass book creates a self-adhesive badge and a visitor log at the same time. The visitor wears the I.D. badge (visitor sticker), which tells everyone they have signed in. The visitor log serves as permanent record of everyone that's been in your facility. The books are available with a time-expriring void feature which makes the badge turn red with the word 'VOID' appear, showing that the visitor has overstayed his visit. The Visitor Pass books comes with 500 adhesive sticker badges (with duplicate entries for your records). There are many different options for your sign-in book, so contact us today on 02 9651 6000 or use our enquiry form to discuss your options with us.